Recent news indicates a new U.S. Department of Labor rule will be set forth in the fall of 2019. But don’t be distracted. There’s another piece of legislation that needs your attention. Pending tax reform, which will likely be addressed when Congress reconvenes in January, puts several tax benefits in question for retirees and their beneficiaries. And, some are critically important in the transfer of wealth. It’s estimated that trillions of dollars of wealth will pass to the next generation over the next two decades. It will come to the surprise of many beneficiaries, however, that most of their money will be taxed. One of the changes that the Retirement Enhancement and Savings Act addresses is the ability to stretch qualified accounts at death of an IRA owner. It would limit the amount to just $450,000. Everything else would have to be received as a lump sum or within five years of the death of the IRA owner. This places a significant amount of tax due at the time of death. As I travel around the country, I sense that the increased federal gift and estate tax exemption limits have lulled planners and their clients from looking at the income tax payable at transfer. That’s dangerous – they could be dropping an income tax bomb on their beneficiaries. Like any obstacle, legislation can become an opportunity for the financial services community. There are several ways that you can position your clients – and their beneficiaries – to win, regardless of what happens in Congress. With the lower tax rates introduced by the Tax Cut and Jobs Act of 2018, it benefits the client to convert qualified accounts to Roth IRAs. This allows the client to have tax-free income for retirement. At death, the proceeds are disbursed tax-free to beneficiaries as well. The embedded gains in nonqualified annuities are treated as taxable distributions, and they are generally taxed on a last in, last out (LIFO) basis. This creates a great opportunity to take advantage of innovative income riders that allow the exclusion ratio to be used for tax purposes. More importantly, it allows the beneficiary to access the cost basis first at the death of the current annuity holder. That puts the beneficiary in control – not the IRS. Finally, it’s always a great time to discuss the importance of life insurance with large IRA holders. It remains the most tax-efficient method to transfer wealth. So, the government is likely to continue regulating the way we interact with our clients. But Congress is likely to have a larger impact due to the tax consequences on our income strategies. Focus on creating income that is efficient for both clients and their beneficiaries. Don’t let the DOL distract you. Pay attention to regulation that can impact your clients’ future. 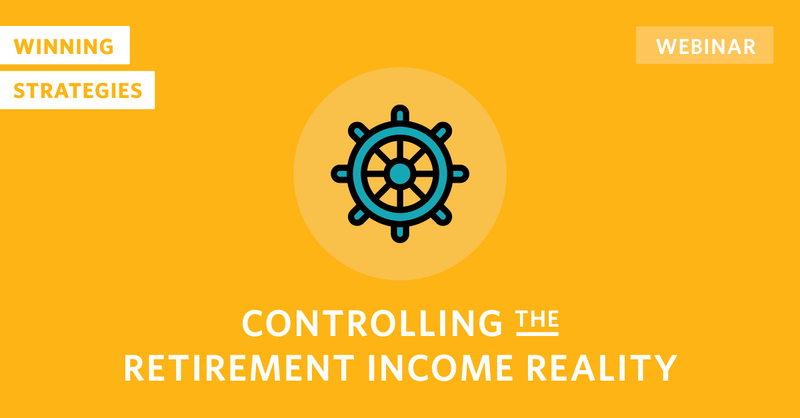 Catch the final retirement webinar of 2018 where Mike is joined by retirement income expert Patricia Taylor, MBA, ChFC®, CFS®. Watch the replay to hear case studies and strategies that highlight new, untapped and hidden opportunities for 2019, and how you can make yourself more referable than your competition! In the financial world, 2018 was an eventful year – starting with the most sweeping tax reform in decades. Many charities will likely see reduced gifting because donors lose the financial benefits of making a donation. However, a few outlets have been talking about a unique gifting strategy – Qualified Charitable Distributions, or QCDs. QCDs aren’t new. They’ve just been out of favor – or at least unknown – for some time. Previous tax brackets and limits for itemized deductions made this strategy less favorable. Today, with a higher standard deduction for individuals and older couples, QCDs will become much more valuable for charitable contributions. For retirees, the result can be hundreds to thousands of dollars in tax and premium savings. Using this type of charitable contribution allows your clients to continue benefiting their favorite charity without taking a hit to their personal finances. 2019 is new ballgame. New tax laws. New regulations. New strategies. Try a new way to help clients with Qualified Charitable Distributions. Many people say they can’t take a 2 percent return on their money. This was especially true after the financial crisis and the aggressive monetary policy in the United States. However, many Americans have felt that 2 percent was a good return on vehicles like certificates of deposit or money market accounts. Regardless of your perspective, you can never take 2 percent as a probability of success in your retirement plan. Well, that’s exactly what you might find for many Americans. With just one, three-year long-term care event during retirement, an otherwise successful plan could be wiped out. In fact, we have several case studies that show the impact of a long-term care event on a retirement portfolio. All are devastating to the probability of success, regardless of market performance. We find that many people who use Social Security properly and have saved a comfortable nest egg can generally retire at or close to their spending levels. That’s not to say that annuities can increase the probability of success to higher levels, but most Americans aren’t too far off their goals with a few solutions, not sacrifices. However, if we factor in a long-term care event, that dramatically changes the client’s chances of success. In many cases, the probability of success drops from 85-95 percent down to just 2 percent for a healthy spouse. A client can feel comfortable with 85 percent, but not 2 percent. Many people have been comfortable living with 2 percent for a rate of return. Unfortunately, when you show them 2 percent probability of success, they lose nearly all comfort and confidence. Make sure you provide an appropriate probability of success to your clients’ retirement plans by addressing the risk of long-term care. Talk about long-term care. Ask questions. It could mean the difference between a success rate of 95 percent or 2 percent. Catch the latest Winning Strategies video where Mike dives into risks in retirement! 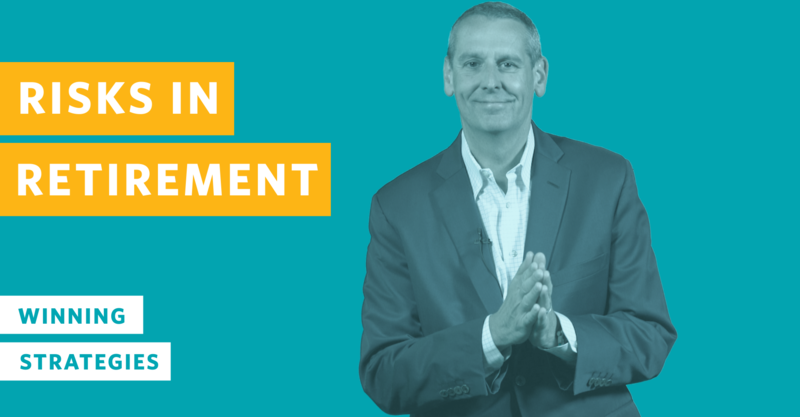 One of the largest risks in retirement is a long-term care event.Mike shares two winning strategies you can implement as an advisor to help clients make it through retirement with confidence. More Americans are living to age 100 than ever before and the number continues to grow. If you are looking at separating yourself from the competition, you must address the impact of inflation on both income and assets for your retirees. Some people consider inflation to be the cruelest tax of all. It slowly eats away at the value of the dollar over time. Most people don’t feel it year-by-year. But at some point in the future, the client will wake up and say they can’t afford the same things they did at the beginning of retirement. That’s on us. One of the best strategies to protect income erosion is to maximize guaranteed income streams that have inflation protection. Below are a few examples. Social Security – This income stream has a built-in inflation hedge with annual increases tied to an index reflecting consumer price increases. If you position Social Security correctly, and leverage its growth past Full Retirement Age, the higher income grows with the index. This provides a higher likelihood that the retiree will be able to afford the same things in 20 years that they do today. Guaranteed Income Annuities – With any asset that you control, you can leverage the power of guaranteed income options available on some annuities. It’s important to realize that any person should limit the amount of funds that go into annuities to the proper allocation. If too much of a person’s assets go into a conservative vehicle like annuities, it can actually decrease the probability of retirement success. Inflation Riders – Several income riders can provide increases tied to the underlying index. Single-premium annuities have options for a guaranteed 3-5 percent inflation adjustment. You need to understand the client’s risk tolerance before deciding which solution is appropriate for them. Maintaining control is an important aspect with many clients that should not be overlooked. Regardless of the solution you provide for inflation, make sure you don’t make your client sacrifice their standard of living due to loss of buying power. Protect clients from inflation. Make sure not only their assets but also the income streams increase with inflation during retirement. I’ve said it before, and I’ll say it again: One of the easiest ways to secure your clients’ retirement success is by addressing long-term care. The cost of extended care continues to escalate. And it will continue to climb as Americans live longer and the demand for care increases. If you’re not protecting against this risk, you’re doing you and your clients a huge disservice. Today, there are more than $471 billion of annuities on the books of insurers.1 Rarely do our clients annuitize these older annuities, and the utilization rate for income riders remains low. Both of these facts make me think that many people purchased these fixed and indexed annuities for a future need or emergency. If that is the case, why not apply the annuity for the specific purpose of covering emergencies? Under current tax law, annuity owners are allowed a tax-free exchange between annuities under certain circumstances. The contract being exchange and purchased must have the same owner and annuitant and considered like-for-like. If the exchange meets that criteria, the embedded gains (deferred interest) may continue to be deferred in the new contract being purchased. With the Pension Protection Act, there is a new level of tax-free status with nonqualified annuities. When the client has a qualifying long-term care event, proceeds from the annuity are received tax-free. That includes the carrier’s funds as part of the long-term care insurance, the original principal (cost basis), and all the deferred gains in the contract. Older contracts like variable annuities, fixed annuities, and fixed indexed annuities qualify for this exchange treatment and potential for tax-free distributions due to long-term care. Your clients’ needs change over time. You routinely adjust their asset allocation with market conditions and changes in risk tolerance as they age. You can also change the purpose of their existing annuities to match their current purpose. Take a look at your existing book of business. Or, ask about a prospective client’s annuity holdings. It’s likely to make a lot of sense to your clients to re-purpose some of their assets in order to create leverage and tax efficiency. Turn old assets with tax-deferred gains into tax-free distributions for long-term care event. The transaction is easy to complete and benefits many who are holding older annuities for an emergency. Across the country, advisors are telling us they’d love to find a steady stream of clients. Well, more than $3 trillion in pension assets are ready to move to either insurance carriers or employees in the next two decades. So, with the right approach, pension risk transfer can provide sustainable growth for any financial services firm. 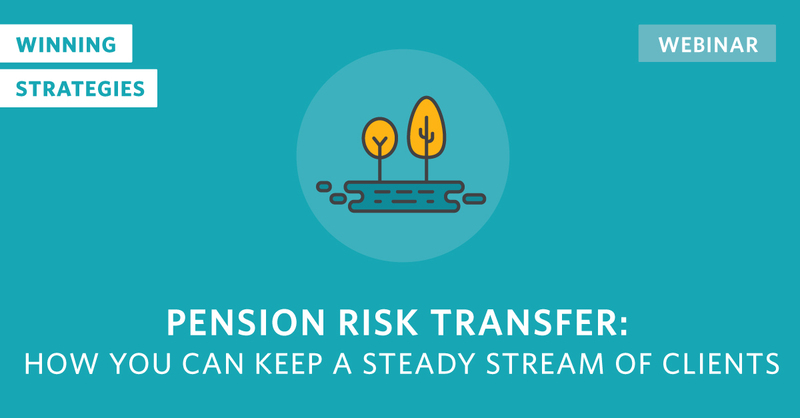 Join us for a powerful webinar featuring Pension Risk Transfers in today’s financial world.